I made bison stew in the slow cooker. It’s photogenic. On the other hand, I think I must’ve let it stew too long. The meat is tough and the vegetables are falling apart. Made poor Martin eat it, anyway; don’t want to waste any meat. 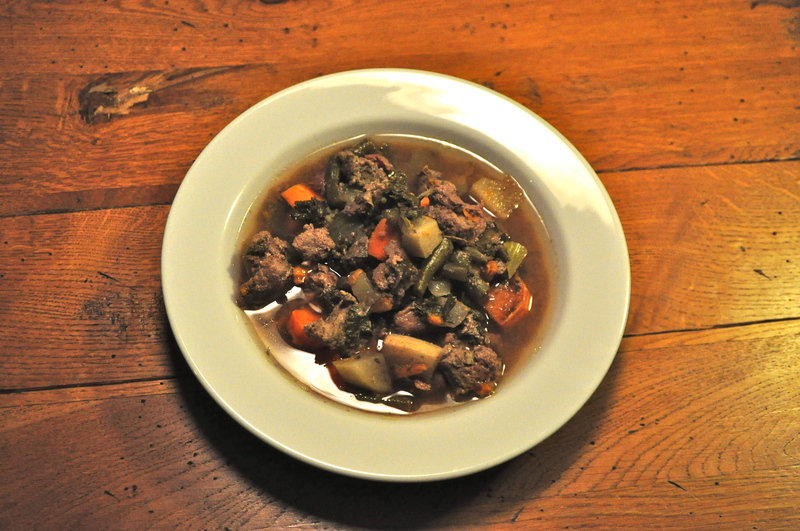 Anyone with advice on the proper way to cook meat stew—seriously, I Googled “How much water do I add to stew?”—please feel free to reply to this post or email findingmykid@yahoo.com and fill me in. This entry was posted in Food by findingmykid. Bookmark the permalink. Never made bison stew. But generally, I use the broth of whatever meat I’m stewing instead of water. (Beef broth for beef stew, etc.) And coating the meat with flour before stewing it helps the stew thicken. (mix salt and pepper to the flour for extra flavor) What temperature are you using for the slow cooker? I let it cook for 4-6 hours on a high temp setting or 10-12 hours for a low temp setting. When making stew with beef/bison/etc., it’s best to cook the meat with some broth and spices until the meat is fully cooked (the fact that the bison was tough tells me it wasn’t cooked long enough). You add the vegetables at the end and cook those very lightly so you have vegetables with some bite and meat that just falls apart. I guess I thought the tough meat meant overcooked. Okay, good tips. We’ll try stew again next week. I’ll report back. You can’t really cook stew meat too long. Meat gets tough and over a very long time the proteins break down and eventually the meat will start to fall apart. Here is a little cheat (although not sure you can use it for this purpose)–put a bit of kiwi (maybe 1/2 for a pot) chopped into the stew at the beginning of cooking. Not sure of the chemical reaction that takes place, but kiwi will make the meat very tender very fast. Of course, for taste, cooking it longer is better. That kiwi trick sounds like my kombu trick for getting beans to cook faster. Your stew meat may be the problem. When buying “stew meat” you want to make sure it’s from the shank, shoulder, or neck. These cuts are rich in intramuscular fat and the connective tissue collagen. These two components are what break down in the low-slow cooking process and result in that soft, moist, texture you’re looking for. When I make stews, I first season and brown all of the meat and reserve it to the side. After, I add aromatic vegetables, ie. carrots, celery, onions, garlic to the same pan I browned the meat in. Sweat or brown your vegetables and then add your wine (red for richer meats, white for lighter), and stock (low sodium natural stuff is best). Put your browned meat in with veggies and broth with any additional aromatics you like ie. thyme, rosemary bay leaf, and cook at a slow simmer for 2-4 hours depending on how big the pieces of meat are. It’s easy to tell when they’re done, you’ll be able to break them with the back of a fork. The vegetables you started your broth with will be mush by the time the stew is done, strain them out saving the meat obviously, and the broth. Do veggies you want in the finished product separately. I like simple steamed carrots, parsnips, pearl onions, mushrooms rewarmed in the stew broth. Some chopped herbs added to the broth at the last minute are yummy too. Chives, parsley, tarragon. This basic technique works for the tougher cuts of pork, veal, chicken, duck, beef…….. Thanks for your comment! That’s great information. There are ingredients there that I can’t use for Martin (wine, onions, chives), but I think I can work around them and employ that technique. For the stock, I’m using only what I make myself. I wonder—should it be made from the same meat as is in the stew, or can I (for example) use beef stock to make bison stew without creating some weird Frankenstein taste? I’m especially concerned about easy-to-do taste, because I can’t (won’t) taste any meat products myself, so I have to go on smell and faith that I’ve done a good job. Also, fortunately, I visited a farm today and picked up a shoulder cut. That can be next week’s stew meat. Wine, onions, and chives can certainly be omitted. Stocks are totally interchangeable. For example, at the restaurants we often braise beef in brown chicken or duck stock. I actually prefer using lighter stocks for some richer applications. The key to the stocks is simmering them low and slow to extract the maximum amount of flavor and collagen. The collagen (College Inn) gives stocks its body. If the stock is reduced enough it will thicken naturally, no need for flour. Beef stock simmers overnight in some cases. Chicken usually gives up everything it has in 4-6 hours. Aromatics, aromatics, aromatics. Bay leaf, thyme, rosemary…..Heartier herbs that can withstand a long cooking time boost the flavor. Consider making the stew a day or two before you serve it. It’s always better cooled then reheated. Make sure the cooling process is done fast and keep your meat submerged in the liquid so it doesn’t dry out.